Impress their eyes as well as their taste buds with our Hot Chocolate Torte. 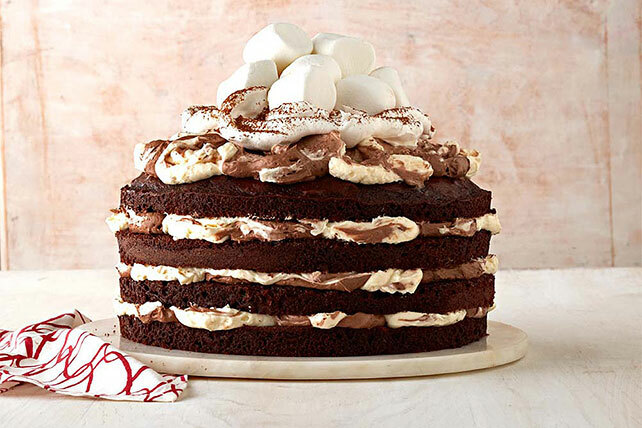 Our Hot Chocolate Torte is layer after layer of chocolate pudding and cake. Cut each cake layer horizontally in half. Beat white chocolate pudding mix and 1 cup milk in large bowl with whisk 2 min. Stir in 1 cup COOL WHIP. Repeat in separate bowl with remaining pudding mix and milk, and 1 cup of the remaining COOL WHIP. Place 1 cake layer on serving plate. Spoon 1/4 of each pudding mixture onto cake; swirl gently with knife while spreading to cover top of cake layer. Repeat 3 times. Top with remaining COOL WHIP, cocoa powder and marshmallows. Refrigerate 1 hour. Prepare using your favorite flavor of chocolate cake. Use a serrated knife to easily split the cake layers. The cake layers can be baked in advance. Cool completely, then cover loosely and refrigerate up to 24 hours before using as directed.